March 16, 2014 - The Department of Transportation's Federal Aviation Administration (FAA) released the findings of a review team formed in January 2013 to review the Boeing 787's design, manufacture and assembly processes. The joint team of FAA and Boeing technical experts found that the aircraft was soundly designed, met its intended safety level, and that the manufacturer and the FAA had effective processes in place to identify and correct issues that emerged before and after certification. 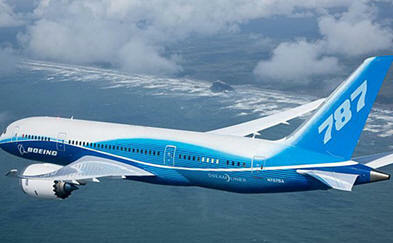 The team made seven recommendations for further improvements in Boeing processes and FAA oversight. FAA Administrator Michael P. Huerta asked the team to review the 787's critical systems on January 11, 2013, after a lithium battery fire on a 787 in Boston. The FAA members were engineers and other technical experts who were not closely involved in the original 787 certification process. As one indicator of the B787's intended safety level, the team compared service reliability data from the time the aircraft first started service with similar data from other previous Boeing airplane models. They determined that the B787's reliability performance in the first 16 months of service was comparable to the reliability of other new Boeing models over the same time period, including the B777. "After the first Boeing 787 battery incident last year, I called for a comprehensive review of the entire design, manufacture and assembly process for the aircraft as well as a critical look at our own oversight," said FAA Administrator Michael P. Huerta. "The review team identified some problems with the manufacturing process and the way we oversee it, and we are moving quickly to address those problems." Team members traveled to manufacturing facilities in the U.S. and abroad and used in-service data and safety risk management principles to conduct in-depth reviews of the B787's critical systems. They chose specific components to examine more thoroughly, including the aircraft's Variable Frequency Starter Generators, Electrical Power Panels, Fuel Line Couplings and Aft Fuselage Sections. The team identified issues in the manufacturing and supplier quality areas and made four recommendations to Boeing to address those issues. The team made parallel recommendations to the FAA for improved, risk-based FAA oversight to account for new business models. The FAA already is addressing the team's three FAA recommendations by revising internal policies and procedures for manufacturing oversight. The team recommended that Boeing should: continue to implement and mature gated design and production processes; ensure suppliers are fully aware of their responsibilities; establish a way to ensure suppliers identify realistic program risks; and require its suppliers to follow industry standards for personnel performing Boeing-required inspections. The team recommended that the FAA should: revise its order on certificate management of manufacturers to recognize new aircraft manufacturing business models; revise its order on production approval procedures to more fully address complex, large-scale manufacturers with extended supply chains; and revise other orders to ensure engineering conformity inspections for all projects are based on risk. Based on the team's recommendations, the FAA is revising its policies, orders and procedures: to use risk tools to ensure manufacturing surveillance is conducted at the highest risk facilities; to assess risks related to emerging technologies, complex manufacturing processes and supply chain management; and to make engineering conformity determinations using standardized, risk-based criteria. As a result of those changes, FAA manufacturing inspectors will expand their review of production and quality data for critical suppliers, including those located outside the United States. Through a Global Manufacturing Team the FAA chartered in 2011, the FAA is allocating resources to the areas of greatest risk at the point of manufacture to maintain appropriate FAA oversight. The FAA also is working on a rule to strengthen the supplier reporting process for quality issues at all tiers of the supply chain.